NETWORK FINALS: 60 MINUTES gained 0.2 in final numbers, while ABC’s PREP & LANDING reruns were up 0.1. 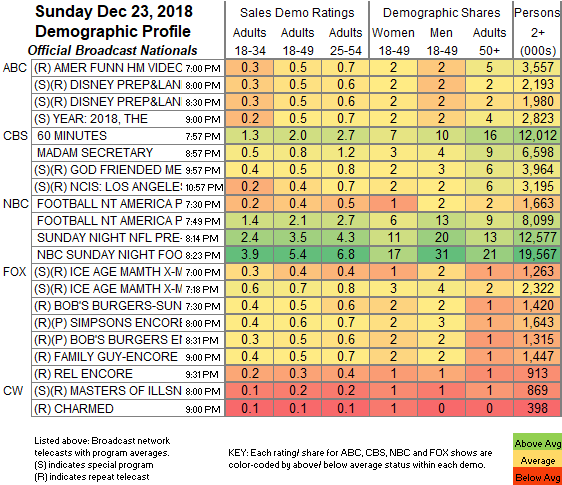 In addition, the NCIS: LA rerun that barely counted as primetime with a 10:57PM start time had a 0.4 rating. Football adjustments at FOX dropped the 7PM ICE AGE special rerun by 0.5. SUNDAY NIGHT FOOTBALL adjusted to 5.4, steady with last week’s game. 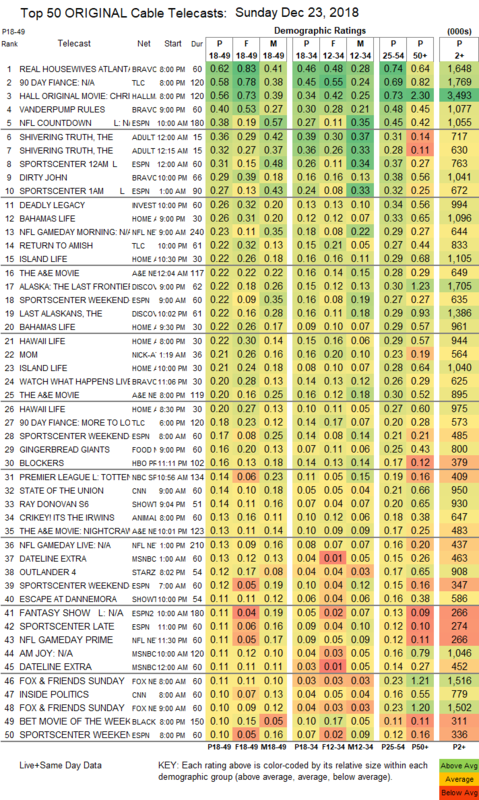 NOTE: At this time, we have no Sunday cable ratings lower than the Top 150 in the charts below. CABLE HIGHLIGHTS: Despite the holiday weekend, many Sunday cable shows aired new episodes. Hallmark’s movie CHRISTMAS MADE TO ORDER topped scripted at 0.56. Adult Swim’s THE SHIVERING TRUTH was at 0.36/0.32, compared to last week’s 0.30/0.28. Bravo’s DIRTY JOHN ticked down to 0.29 (steadier than its unscripted lead-ins, as to which see below). On Showtime, RAY DONOVAN dropped 0.03 to 0.14, and ESCAPE AT DANNEMORA was down 0.02 to 0.11. On Starz, OUTLANDER fell 0.07 to 0.12, and COUNTERPART ticked up to 0.03. The season finale of HBO’s SALLY4EVER ticked down to 0.03. Bravo’s REAL HOUSEWIVES OF ATLANTA led unscripted, down 0.06 to 0.62, with lead-out VANDERPUMP RULES down 0.07 to 0.40. On TLC, 90 DAY FIANCE fell two-tenths to 0.58, and RETURN TO AMISH was at 0.22. ID’s DEADLY LEGACY lost 0.04 to 0.26. HGTV’s line-up was led by BAHAMAS LIFE at 0.26/0.22, compared to last week’s 0.18/0.17. On Discovery, ALASKA: THE LAST FRONTIER dropped 0.06 to 0.22, and THE LAST ALASKANS was steady at 0.22. Food Network’s GINGERBREAD GIANTS was at 0.16.